I’ve been lucky to have some fantastic guests on my podcast, How I Built It (over 100, in-fact)! 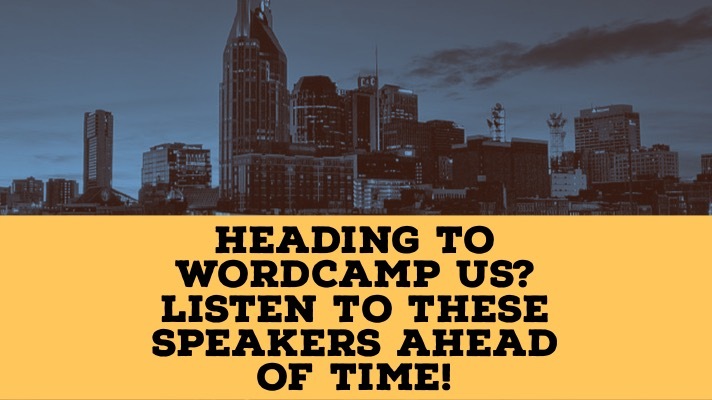 Many of them are active in the WordPress space, and a select few will be speaking at WordCamp US this weekend. If you’re traveling to Nashville, take some time and listen to them talk shop with me. Whether you’re stuck in a plane, train, or automobile! Joost was another early guest, and we talked in Episode 8 about how he built Yoast SEO, the popular Search Engine Optimization plugin for WordPress and other platforms. His thoughts on scaling and testing for millions of sites should not be missed. His talk is 10:00am on Saturday in the Banjo Room and is called Thrive for the future: the business of open source. Morten’s episode is one of my favorites – we talked for an hour about education, WordPress, and empathy. He always offers thoughtful insight on whatever he decides to discuss, and he was no different in this interview. Morten kicks off Saturday at 9:00am in the Banjo Room. His talk is titled, Moving the Web Forward with WordPress. Rian and I met at WordCamp US 2017 and hit it off immediately. She’s an Intellectual Property lawyer and in her episode we talked all about Trademark and Copyright. She’s a wealth of knowledge and the conversation was interesting and very different from the usual guests! Unfortunately Rian has to cancel her trip due to an emergency, but you can still catch the talk she and Leo Postovoit were going to do together in the Banjo Room on Friday at 4:45pm – What’s Privacy Got To Do with IT? Come Say Hi at WordCamp US! If you’re attending WordCamp US, come say hi! I’ll be there both days, and I’m emceeing the Banjo Room Friday morning. I’d love to talk WordPress, Podcasting, or anything else!